The header is printed on the first page only as I need, but the header box (empty) still present on other pages. How to get rid of it? 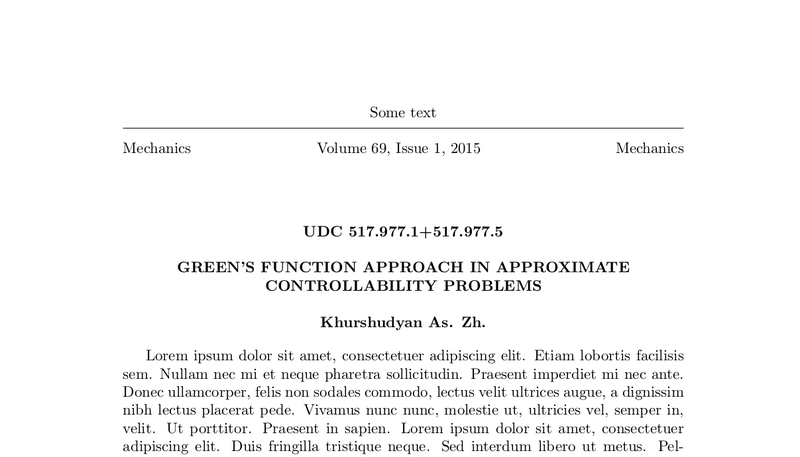 A mathematical method based on Green`s function approach widely used, in particular, for solving problems in mathematical physics and deformable body mechanics which allows to construct controls providing approximate controllability is suggested in the present paper. Representing the solution of governing system via Green’s formula and forcing the controlled state function to satisfy required terminal conditions, we obtain implicit representation for admissible controls. Choosing appropriate controls, we can provide required accuracy of approximation for terminal condition. Particularly, infinite string controlled by a concentrated force and semi-infinite rod heated by a point heat source are considered. Examples illustrating the procedure are described. Results of numerics are brought. If I understand your setup correctly, there's actually no need to define a header block just for the first page. Instead, I suggest you do something like the following. A mathematical method based on Green's function approach widely used, in particular, for solving problems in mathematical physics and deformable body mechanics which allows to construct controls providing approximate controllability is suggested in the present paper. Representing the solution of governing system via Green’s formula and forcing the controlled state function to satisfy required terminal conditions, we obtain implicit representation for admissible controls. Choosing appropriate controls, we can provide required accuracy of approximation for terminal condition. Particularly, infinite string controlled by a concentrated force and semi-infinite rod heated by a point heat source are considered. Examples illustrating the procedure are described. Results of numerics are brought. Since you say that the bit of text is part of the title, not actually a heading ... don't use the mechanism to generate a heading. Do it like you would do it with any other title, add a bit of space by hand. Not the answer you're looking for? Browse other questions tagged header-footer fancyhdr or ask your own question. Suppress Fancy header and footer on first page only. How to get a separate header only for the first page?